In the foreground is Tallulah Trice, director of the Beaufort County Animal Shelter. Pictured from left to right: Lindsey Edwards, Kristin Trafton, Amanda Bellnier, Stephanie Brumley, Ricky Mellen (Volunteers 6 days a week), Alice Schmett and Cindy Colleran. A plastic baby gate spans a doorway leading to Tallulah Trice’s closet-sized office at the Beaufort County Animal Shelter, where a tail-wagging, belly-sagging sentry named “Nanny” is delighted to see the return of a crucial new friend and guardian. “She’s inside with us today because she’s been feeling needy since we found her wandering nearby three days ago,” said Trice, director of the aging county facility located just off the runway of the Marine Corp Air Station in Beaufort. “She’s just had a litter, and she’s still lactating, plus she’s heartworm positive, so we’ve put her on medication. We weren’t able to find her puppies.” So Nanny, a black spaniel mix with sad brown eyes and a permanent smile courtesy of an endearing under bite, is getting some much-needed people time as she adjusts to life behind bars and awaits a future that’s brighter than one might predict for just another captured stray confined to doggie jail. That’s because Trice, working in concert with a wealth of Lowcountry animal advocates including those at the private no-kill Hilton Head Humane Association, has been making dramatic changes at the taxpayer-funded facility since taking over the post about two years ago. New programs, including Facebook posts of newly captured animals are reuniting nearly 40 percent of owners with their missing pets; euthanasia and population rates are on an encouraging decline, and community support is swelling under Trice’s brief tenure. All while saving taxpayer money to boot. “The biggest change has been turning the county facility into more of a transfer station,” she said, “so instead of concentrating on adoptions here, our job is focusing on their health and getting them into the right hands for adoption elsewhere like on Hilton Head.” Unclaimed animals like Nanny no longer face death sentences after mandatory holding periods, instead getting the most precious gift possible: added time to find them new homes. 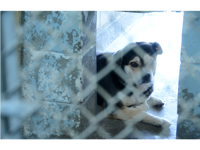 Indeed, euthanasia has decreased to about 27 percent of the shelter’s intake of more than 4,500 animals in 2013, marking a dramatic decline from the not-so-distant days when nearly 80 percent of unwanted animals never left the shelter. Trice and 13 coworkers intend to improve those numbers even further in the future. “The only time we euthanize today are in cases of dogs that are aggressive, or because of the (ongoing) overpopulation of feral cats,” Trice noted. “Very few of them are taking that last walk along what we call ‘The Green Mile.’” Indeed, euthanasia has decreased to about 27 percent of the shelter’s intake of more than 4,500 animals in 2013, marking a dramatic decline from the not-so-distant days when nearly 80 percent of unwanted animals never left the shelter. Trice and 13 coworkers intend to improve those numbers even further in the future. Instead of remaining on site, adoptable animals often end up making a quick trip to nearby Tabby House or the Hilton Head Humane Association for adoption, sometimes in Trice’s personal car on her way home to Bluffton. Others have become part of a growing volunteer transportation movement, borne out of the aftermath of Hurricane Katrina in 2007 that ships animals to metropolitan areas such as Atlanta, where there’s an ongoing demand for adoptable animals. Such heartwarming tales are offset by harsher realities. “Dog fighting is still rampant in rural areas of Beaufort County and we don’t have the money to drive around patrolling the entire community,” Trice said. “So we rely on people to be our eyes and ears and report things so we can address the problems. 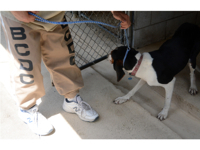 A lot of what we do is about education,” she added, noting that proactive animal services officers are happy to tell owners about more humane ways to tether their dogs while also encouraging them to take them on walks with proper leashes. “And sometimes life just happens,” Trice said. “People get divorced, they have to move or something else happens in their lives where an animal ends up here.” Sure enough, during a tour of the well-worn shelter that dates back to the 1970s, a dog owner shows up to return a white, AKC poodle with a piddling problem that damaged new carpets in his trailer. “She’s a good dog, but she’s four-years-old and still isn’t house trained; we just can’t keep her,” he said, declining additional identification. The abandoned poodle will be heading to Hilton Head Humane where, problem noted, she’s still likely to be adopted in short order. The tour continues, making stops at rooms named in honor of shelter coworkers. 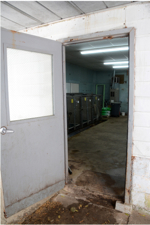 There’s “Alice’s Room,” where quarantined dogs recovering from recent surgery are among those in individual cages awaiting their next step toward freedom. In “Amanda’s Room,” a horde of healthy cats climb on carpeted roosts, ever awaiting a group of local youngsters who drop by on occasion to read children’s books to felines. 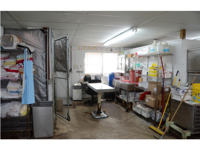 What used to be Trice’s office has been transformed into an intake area, where arriving animals are isolated to prevent contagious disease before being incorporated into the facility’s general population for eventual transport to offsite adoption centers. Rundown back buildings house the borderline cases, and a jail trustee is putting some dogs through open-yard paces geared at making the canines even more adoptable. It’s only in passing that Trice notes that county administrators and their elected counterparts are discussing constructing a new county facility, perhaps in a new locale. “This probably isn’t the best place to assess the future of an animal,” she said, as another Marine Corps jet fighter screamed in for a landing, temporarily cutting off further conversation. “I’ve never worked in government before,” she eventually continued. Trice, who has been sharing her life with animals across the country since she was a teenage shelter volunteer growing up in Lookout Mountain, Ga., regards a career that so far has taken her to training Boykin Spaniels in Charleston and hunting dogs in Seattle before winding up as the county’s top administrator, officially charged with concerns about animal welfare. Another crumbling out building is packed with pit bull mixes and other animals that are difficult or impossible to adopt because of community bans on the canines, but even these less desirables are getting reprieves to become more socialized and perhaps find homes. A sullen if sizable Bull Mastiff that reportedly “nipped” at a child won’t be among the dogs released down the road; instead a nearby breeder will incorporate the dog into an all-canine population with plenty of room to roam minus youngsters. 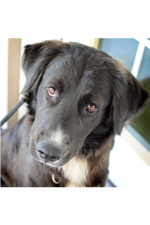 More cuddly purebreds such as Labs end up transported to facilities such as Lowcountry Lab Rescue for future adoption. “It’s taken a lot of teamwork here at the shelter along with the community at large to find homes for these animals,” Trice said. Of the more than 4,500 animals that passed through the shelter in 2013, more than 1,500 were transferred to various rescue organizations. 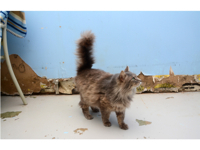 Another 633 animals were returned to owners, and 741 felines were adopted at non-profit Tabby House, resulting in an overall net live release rate near 66 percent, a 12 percent improvement over the previous year. More than 500 animals last year discovered welcome new digs at the Hilton Head Humane Association, headed by executive director Franny Gerthoffer, and the no-kill shelter also spayed or neutered nearly 7,000 domestic animals and feral cats last year. In addition, the island facility donated more than $10,000 toward medical costs and no less than 20 pounds of food per month to assist the county shelter. Meet Mufasa, a 1.5 yr old beauty. He is just a bit shy, but so, so sweet! The day CH2 went on the photoshoot, Mufasa was moved to Hilton head humane to be adopted. Advocates for animals in the Lowcountry come in all ages, shapes and sizes, from the fit U.S. Marine Corps volunteers who toss flying discs to teach county shelter dogs new tricks and make them more adoptable, to the less-imposing uniformed ‘tweens’ at Hilton Head Middle School who provided blankets and towels during this past rugged winter to help keep furry creatures comfortable. In this tight-knit animal rights community that relies on word-of-mouth from a cadre of unsung volunteers, Carnes quickly learned about “the powerful changes” that were going on at the Beaufort County Animal Shelter since the 2012 hiring of new director Tallulah Trice. “We learned about their shortage of funds for heartworm treatments; this seemed a perfect fit,” Carnes said. The students joined forces with Operation Saving Jake that assists military personnel, but initial discussion of the joint fundraising effort was met with some reluctance. “I had a student come up to me in homeroom and ask the class, ‘Why are we doing a fundraiser that’s going a help a (county-run) shelter where they kill animals?’ “The students all knew growing up here that if an animal was taken to the county shelter it was probably going to die.” So Carnes paused, and then began informing the collected students that, yes, the county shelter will never become a no-kill facility—that’s because of county public safety laws against releasing aggressive animals—but told them that Trice had greatly reduced the euthanasia rate through a series of progressive programs to transport the animals elsewhere for adoption. “They were impressed when I told them how Tallulah had reduced the euthanasia rate from above 80 percent to about 27 percent in only a couple of years, and she’s trying to lower it even more,” Carnes said. 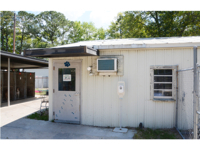 “They realized what a passion Tallulah has for saving animals, so that pretty much ended any more discussion.” And after a few years of declining interest in fundraising projects, Carnes reported that students jumped in with both feet to assist the county shelter. The Valentine’s season fundraiser this year found students making video advertisements—aired during morning announcements—to bolster school-wide interest, while other classroom cohorts rounded up old T-shirts and braided them into dog toys. Some devoted time to walking dogs for community service; others created novel T-shirts. Their efforts drew a welcome boost when Howell Chase HVAC and Beach Properties of Hilton Head joined the fundraising effort. And whereas funds from past fundraisers were usually measured in coin counts, this year’s tally topped $725, not forgetting all the toys and donated blankets to increase creature comfort. Students, coincidently, were rewarded with a modest pizza party, a no-uniform ‘casual Friday’ and, above all, knowledge they assisted the less fortunate with community teamwork.